2014 has ended. And I am very glad. 2014 was a year full of struggles and heartaches that couldn't be shared. It was also a year full of changes. Some for the good and some for the not so good. But it was a huge year of transition either way. I am looking forward to seeing what 2015 has to offer. And to do that in a good way I am going to do some things differently. I am not choosing one word this year and I am not choosing one verse for the year. While in 2014 I did create a great many things, I felt defined by the one word and was unable to move past that. And yes I know that is a "me" thing and not how it really was. I am also going to say no more in 2015. I am enjoying reading "The Fringe Hours" by Jessica Turner right now (and sharing more with y'all later). One of the biggest things that has resonated with me is saying no in order to be able to keep my sanity. I have felt incredibly overwhelmed lately. A lot of it is the fact that I am not saying no where I need to. And the result has been a very tired mom who comes home and doesn't want to do anything. So the house work, laundry, and homework have been falling through the cracks. So there is going to be a whole lot more saying no from me. I am walking a path this year where my focus needs to be on my marriage and my family. With my job being secondary to my home life instead of primary. Going back to work has been a big challenge for me. It is completely different than anything I have ever done and it has not been easy. And the expectations are more than I can do without putting my home life on a back burner. And it just is to much. So that is going to change. So my old path is about to meet a new path where the focus is where it should be. 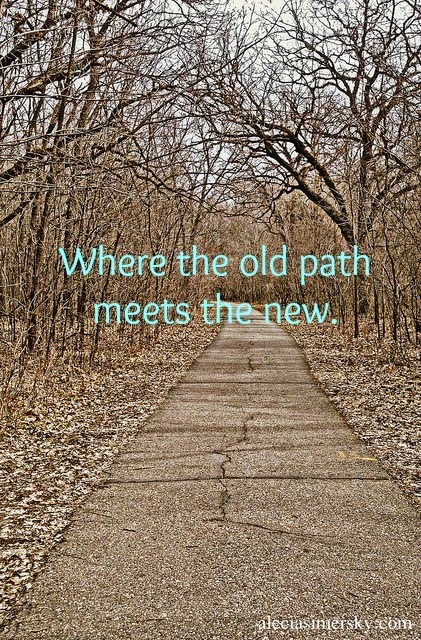 So here's to new paths and a new year!